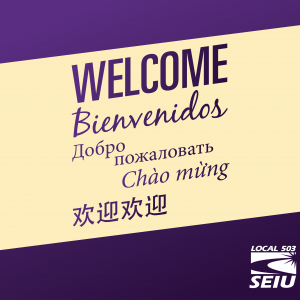 SEIU members are choosing to stick with our union for many reasons. When more people choose to be in union, wages and benefits are better because we can bargain from a position of strength. So what does a good contract mean to you? 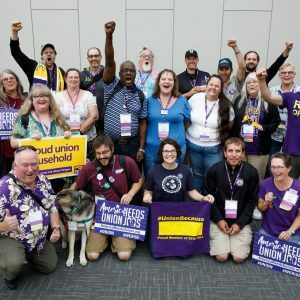 We have an opportunity in 2019 to bargain for better wages for every SEIU member, but we have no chance of succeeding if we’re divided and alone. On average, union workers in Oregon make $4,701 more than non-union workers. SEIU 503 members are more likely to have a good healthcare plan than non-union workers. Don’t go it alone. 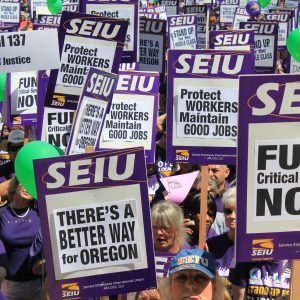 SEIU 503 members and staff have have your back when you need it most. The Member Resource Center wins nearly $100,000 in lost wages for SEIU members every year. Just recently, a member in Dallas won $46,000 in back pay that was owed to them! When an employee at Marion County Public Works was facing discrimination, SEIU members rallied and stormed two consecutive County Commissioner meetings resulting in the removal of two offending supervisors and the launch of a county-wide cultural audit. Members at the Child Welfare hotline are asking for more support for the call volume they are receiving. Nearly everyone in the unit signed a petition that will be delivered to the head of the agency. Workers in Tillamook received a letter of expectations with unreasonable demands from management. A new steward in the office organized a meeting to push back as a group. Management completely folded and wrote the unit an apology acknowledging the letter was not the best way to communicate in a supportive way. Members received a FREE $2,500 life insurance policy. Through our exclusive rewards program, SEIU members receive discounts on everything from phone bills to legal advice to holiday gifts. Unions dues are 1.7% of your salary + $2.75/month. That’s a great deal considering what you get.